Awesome Katana sound and features in a 7W 1x4 combo you can take anywhere. 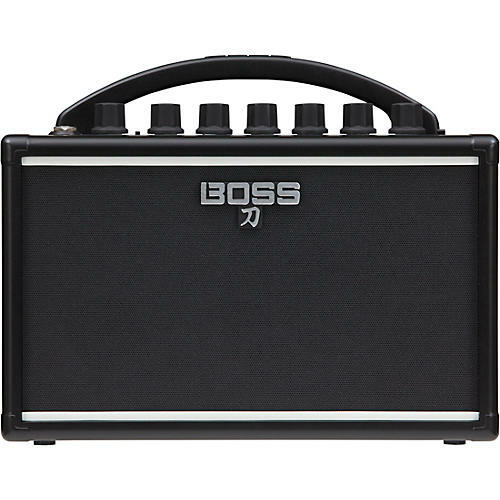 BOSS Katana amps have received accolades from guitarists everywhere for their fantastic sound and feel, onboard effects and great value. Now, the Katana-Mini makes serious Katana tone accessible in a small, go-anywhere amp that runs on batteries. Offering sound quality that far exceeds other amps in its class, this miniature powerhouse features an authentic multi-stage analog gain circuit for big, expressive sound, plus a traditional analog EQ and an onboard tape-style delay. Ultra-compact and travel-ready, the Katana-Mini delivers inspiring Katana tone anywhere you want to play.